A comprehensive description of the organization it took to make New York City gardens a success. “The Community Gardening Movement in New York City: The First Decade” by Amanda Suutari. View original source document, including quotes from interviews. “Community Gardens Revitalize Neighborhoods in New York City” by Steve Brooks. In the financial crisis of the 1970s, large sections of New York City were abandoned by landlords and city officials. Residents revitalized their neighborhoods, reclaiming them from decay by turning vacant lots into community gardens. More than 800 gardens tipped neighborhoods away from crime, toward community action, better diets and cleaner environments. The gardens trained a generation of activists and spawned other environmental projects, in New York and overseas. The thirty-year saga of New York City’s community gardens shows how an EcoTipping Point can be an effective tool for urban renewal, at a fraction of the typical cost. A garden can be more than just a place to stop and smell the roses. Its spin-off effects can help to tip a neighborhood and an entire city out of a cycle of squalor. As garden activist Donald Loggins sums it up, “One person, at the right place at the right time, set a whole bunch of stuff in motion.” The right time was 1973 and the right person was an artist named Liz Christy. She had a studio near the corner of Bowery and East Houston, in the heart of Manhattan’s Lower East Side. The Bowery’s blight had been a long time coming – close to 200 years. Back in the 1600s, it had been an agricultural district south of the emerging downtown. The very name “bouwerie” was the Dutch word for “farm,” and settlers had established farms along the “Bowery Road.” A lake called Collect Pond was a favorite fishing spot, and a resort called Teawater Garden took its name from a freshwater spring, used to brew a favorite local beverage. By the end of the century, the slide had begun. Collect Pond became so polluted by breweries and slaughterhouses that the city filled it in. The farms were covered over by city streets, and the neighborhoods became launch pads for immigrants, first Irish, later German and Italian. They decayed into slums as landlords cut up tenement apartments to squeeze in more renters, who worked in sweatshops at low wages. The streets became the stalking ground of gangs like the Bowery Boys. It got worse in 1878, when the city built an elevated railroad along both sides of Bowery Street. Before, the street had been a district of theatres and nightclubs. Afterwards, nobody wanted to live with trains rushing past their second-story windows. The theatres closed, and the buildings became saloons and flophouses, with names like McGurk’s Suicide Hall. Crime flourished in the shadows under the tracks. For most of the 20th Century, The Bowery became synonymous with Skid Row. By the 1970s, in the wake of urban riots, the apartment buildings were falling down. Whole blocks went vacant as landlord after landlord quit maintaining their properties. The process accelerated as city government flirted with bankruptcy. In poorer parts of town, the city closed police and fire stations. The city government became the not-so-proud owner of thousands of vacant lots when owners defaulted on their property taxes. The vacant lot at the northeast corner of Bowery and East Houston was as notorious as any. In the winter of 1973, it was where two homeless men had frozen to death in a cardboard box. But the block had also attracted Liz Christy. She painted landscapes and saw the run-down neighborhood as a living canvas. She had already been tossing “seed grenades” into vacant lots – water balloons packed with seeds, compost and water – which scattered their contents when they burst. The corner approached an EcoTipping Point one evening, when Christy saw a young boy playing in the garbage that littered the lot. The boy was about to climb into a discarded refrigerator and pull the door shut behind him. The artist was horrified. She pulled the boy out, dragged him to his mother and scolded her for letting him play in the trash. The mother did not take kindly to the reprimand. She responded that she had a house full of kids to watch. If Christy was so worried about the refrigerator, why didn’t she get rid of it? After hauling out trash, piled six feet high, and leveling the gravel underneath, the impromptu landscapers trucked in soil. They marked out sixty raised beds and gathered horse droppings, from a nearby mounted police station, for use as fertilizer. They planted seedlings scavenged from a parks department giveaway. The neighbors, overwhelmingly African-American and Hispanic, were skeptical of a passel of Anglo kids in hippie clothes. But as they saw the Bowery Houston Community Farm Garden take shape, local teens pitched in. Within a few months, they were taking home armloads of tomatoes and cucumbers. City officials were less enthused, and made noises about clearing out the horticultural trespassers. But Christy, who worked part-time in public relations, took her case to the local media. After the New York Daily News ran an article and a photo spread on the garden, officials backed off. For a dollar a year, they leased the lot to Christy’s group, which had dubbed itself the Green Guerillas. The Daily News story exploded like one of Christy’s seed bombs, scattering her ideas across the five boroughs. Soon, she was working full-time, consulting with other neighborhood groups. One wildcat garden led to another, as they sprouted far beyond the Lower East Side. Even the city belatedly jumped on the bandwagon. Starting in 1978, a parks department program called Green Thumb offered plants, tools and horticultural expertise. It also offered dollar-a-year leases to community groups that wanted to cultivate vacant lots. As one garden led to another, the cycles of urban decay began to reverse themselves. The first urban oases bred community pride and stronger ties among neighbors, inspiring still more gardens. At the height of the movement, in the late 1980s, the city hosted more than 800 community gardens. A survey by Green Thumb found the gardeners were growing over $1 million worth of produce each year. If their rows were laid end-to-end, they would stretch 67 miles. The concept spread beyond the five boroughs. In 1976, a Brooklyn congressman persuaded the U.S. Department of Agriculture to support urban gardening with grants and technical assistance. The program eventually covered 22 other cities. New York gardeners joined those from smaller programs in other cities in 1979 to form the American Community Garden Association. The gardens offered an array of vital services that were no longer coming from city government. Some were environmental, and some were social, but like vines climbing a trellis, they were closely intertwined. In the concrete canyons of a big city, a chronic environmental need is open space, and New Yorkers were starving for it. As of 2002, the city had only 4.5 acres of parkland for every 1000 residents. By comparison, Philadelphia had 7.1 acres and Boston boasted 9.3. The gardens made up a mere 200 acres, a tiny fraction of the Big Apple’s 36,000 acres of parkland. But many were concentrated in areas where city parks were not. Fifty were on the Lower East Side, where the ratio was only 0.6 acres of parkland per 1,000 people. The gardens were not just open spaces. They were green ones. Some called them “the lungs of the city.” They pumped oxygen into streets choking with car fumes. They offered islands of shade and cooling in the long, hot Manhattan summers. A single acre could absorb up to two tons of sulfur dioxide, the main ingredient in acid rain. Behavioral science studies suggest that green space can boost mental health as well as physical. Children who moved to more pastoral surroundings improved their attention spans. “Healing gardens” in hospitals have been found to speed the recovery of patients, primarily by reducing measures of stress. In the New York gardens, much of the greenery was edible. Low-income gardeners were eating fresh produce in parts of town where there were no supermarkets or produce stands. Green Thumb found that 75 percent of garden groups also gave food away, to food banks and to hungry neighbors. Surveys in other cities have reported similar trends. Philadelphia’s urban gardeners ate fresh produce from their gardens five months of the year. In Newark, NJ, the average community gardener invested $25 a year to harvest $504 worth of food. Plants were not all that flourished. The diversity of flora created habitats for a diverse array of birds, insects, reptiles, amphibians and small mammals. At Christy’s original garden (renamed the Liz Christy Memorial Garden after she died of cancer and her ashes were spread over the soil), a manmade pond attracted frogs. It was stocked with fish, snakes and turtles, the latter rescued from being eaten in Chinatown. John English, a beekeeper, introduced a beehive that still turns out 100 pounds of honey a year. Once a year, he invites other gardeners to bring jars and stock up. In less visible ways, the gardens performed other environmental services, like recycling. They were reusing urban land that had been abandoned as waste. Most employed secondhand materials, from manure to scrap lumber – an economic necessity as well as an environmental one. Even much of the foliage was recycled. Rockefeller Center donated plants every month, after it changed exhibits. The gardens reduced levels of toxic waste in the ground, though agronomists still cautioned against eating vegetables like lettuce, which absorbed lead. Corn and tomatoes were safer. By growing fruits and vegetable close to home, the gardeners were also eliminating the fuel consumption and air pollution associated with transporting food from distant production sites. Several studies nationwide suggest that gardens and green space might help to lower crime rates. In San Francisco’s Mission District, crimes dropped 28 percent after a community garden led to the formation of a neighborhood watch group. In Chicago, professors Frances Kuo and William Sullivan compared crime rates among 98 apartment buildings in a public housing project. They found buildings with high levels of vegetation had 52 percent fewer crimes than buildings with low levels. The story of the Little Puerto Rico garden, at 10th St. and Avenue B, paints a vivid picture of how a humble garden can take a bite out of crime and other social ills. 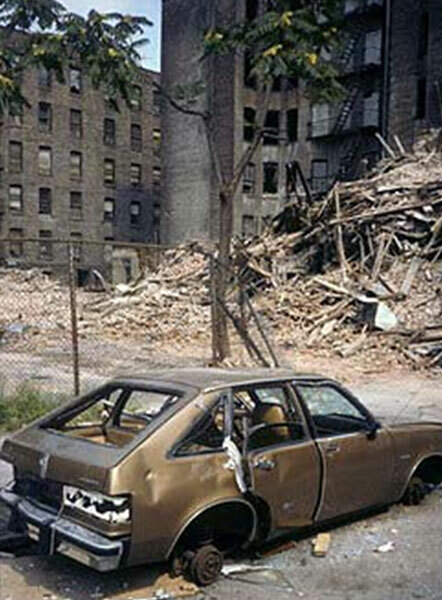 After five tenements were knocked down, in 1977, their lots became home to a scrap dealer who stripped empty buildings. They also became a shooting gallery for junkies and an open-air market for drug sales. After a decade of fear and frustration, neighbors descended on the site. With hoes and baseball bats, they accomplished what city police had not: They cleared the corner of drugs. They also cleared it of abandoned cars and twelve dumpsters of garbage. In its place they put in vegetable plots, a concrete patio and two Puerto Rican-style casitas or small houses, complete with a propane-fired stove and flush toilet. Among the garden rows, and the clucks and snuffles of chickens and rabbits, they recreated a bit of their faraway homes in the big city. “It was a place for all people on our block to go and bond together,” recalls Sara Ferguson, who moved next door in 1994. “People had weddings there and birthdays there. People came and cooked meals there. On Friday and Saturday nights, people would all be out there eating together and playing drums. There was a huge Halloween party, when the casitas would become haunted houses.” She got to know her neighbors as they dug together in the dirt. The elderly Don Garcia taught her how to mound a tomato plant, and which “weeds” were worth keeping for home remedies. Lydia Cortes, a mother of five, watched over the garden while her husband, Isais, fixed cars in the back. Other gardens hosted more formal activities, from plays and dance to yoga and poetry readings. Artists in the Gardens planted paintings and sculptures on walls and pathways, while the Youth Murals Project gave more than 2,000 teens an alternative to graffiti. Each plot was as individual as the people who created it. The Garden of Eden, on Eldridge St., appeared in National Geographic. It was a painting in plantings, with meticulous floral displays and 45 fruit and nut trees, surrounding a central yin-yang symbol. On E. Ninth St., La Plaza Cultural featured an amphitheater and a geodesic dome designed by R. Buckminster Fuller. As a grassroots development program, New York’s gardens were a stunning success. But their very success became a threat to their existence. As they made their neighborhoods more desirable, they made the land underneath them more valuable. As the city government recovered from its slump of the 1970s, its officials eyed the garden lots for uses other than flowerbeds. If the lots were auctioned off for private development, they could once again be a source of property taxes for the city. In the late 1980s, the city started revoking leases and tearing out gardens. At the outset, only a handful went on the chopping block, to make way for low-income housing and drug rehabilitation centers. The Garden of Eden was one of the first to fall, in 1986. A full-scale plague of bulldozers descended after 1994, when Rudolph Giuliani became mayor. Rather than housing for the poor, he put the land up for sale to conventional real estate developers. Little Puerto Rico was flattened the day before New Year’s Eve, 1997. Residents celebrated a temporary victory when the lead bulldozer sank headfirst into a sewage trench. Within a year, though, four-story townhouses were rising from the rubble. Just as biodiversity makes an ecosystem stronger, the gardeners gained from a diversity of tactics. In July 1998, protesters released thousands of crickets into a real estate auction. When El Jardin de la Esperanza went down, nineteen months later, 31 demonstrators were arrested while sitting in a shelter shaped like a coqui, a Puerto Rican tree frog. While some were taking to the streets, others were taking to the courtroom, with help from state Attorney General Eliot Spitzer. The day that El Jardin de la Esperanza was demolished, Spitzer persuaded an angry judge to put most of the auctions on hold. In the end, Giuliani’s successor came to the negotiating table, and some 600 gardens were saved. Two nonprofit groups bought 114 of them, including a $250,000 contribution from New Yorker Bette Midler. Others were transferred to the parks department. Some of the underlying lots could still be sold, but only after the city offered gardeners a substitute piece of ground. “All our organizing and the media coverage we received for our events, rallies, letter writing, and lawsuits, finally shifted the thinking from, ‘The gardens are temporary,’ to, ‘The gardens are permanent – and should be preserved forever,’” says Felicia Young, director of Earth Celebrations. Today, Earth Celebrations commemorates the fight to save the gardens in an annual ritual. The Rites of Spring, a day-long parade, puppet and costume pageant, stops at forty Lower East Side gardens every May. A character named Gaia, named after the Greek earth goddess, is kidnapped, then rescued. At the final stop, her salvation is marked by the release of 50 butterflies. Meanwhile, many of the struggle’s veterans have moved into positions of authority, in city agencies and nonprofit groups. They are quietly working to turn the Big Apple into the Green Apple. “We sort of infiltrated most places,” says Tessa Huxley. Back in her Green Guerilla days, she accidentally broke through a subway roof, while digging a hole for a redwood tree in the Liz Christy garden. Today, that tree is 65 feet tall, and she is managing the parks in Battery Park City, a city-within-a-city that is home to 25,000 people. “The parks are completely toxic-free,” says Huxley. “We do not use any herbicides, pesticides or fungicides. We do an enormous amount of composting. We take vegetable waste from local groceries and Starbucks coffee grounds. We look at our soils as what is going to make the plants healthy. We look at the chemical and biological components, and we develop the compost accordingly.” Her example helped inspire Battery Park City to set “green” standards for all new buildings. Its first “green” residential high-rise opened in 2003, with features like solar panels, recycled building materials, rainwater storage and vaporless paints. The apartments leased out in six months, despite rents that started at $2,300. EcoTipping Point stories are like a two-act play. In Act One, a “negative tip” pushes the eco-social system into decline. Act Two is the positive tip. A catalytic action reverses the decline, and the system picks up momentum on a course of restoration and sustainability. The fiscal crisis of the 1970s sucked The Bowery into a seemingly inescapable spiral of decline. Denying municipal services to the poorest precincts set off a vicious cycle, in which empty buildings and vacant lots bred crime. Residents moved away, leaving behind more empty buildings, more vacant lots and more crime. The Green Guerillas interrupted the cycle. They took one part of the eco-social system – a vacant lot – and changed it from an eyesore to an oasis. A virtuous cycle began. By cleaning out the lot, the gardeners removed a habitat for criminals. As their streets became safer, residents spent more time on them, reducing crime further. As gardening strengthened the social bonds among neighbors, the neighborhood became safer still. Instead of moving out, people started moving in. Empty buildings became occupied. As the virtuous cycle gained momentum, the quality of life went up, and the former slum attracted more and more residents. The rise of one neighborhood triggered the same in others. Guerilla gardens sprang up like dandelions, as the rebirth of The Bowery was replayed in locales around the city. In concert with larger social and economic forces, those neighborhoods began to tip the city towards a more livable condition. At a time when many large cities were consuming ever more farmland and fossil fuels to feed themselves, inner-city New Yorkers were becoming cleaner, greener, and more self-sufficient. The positive change was threatened when the city government started to sell off lots, but the process had generated enough momentum to protect the gains. Most of the gardens survived, and their influence is flowering still, propagating into more and more aspects of city life. 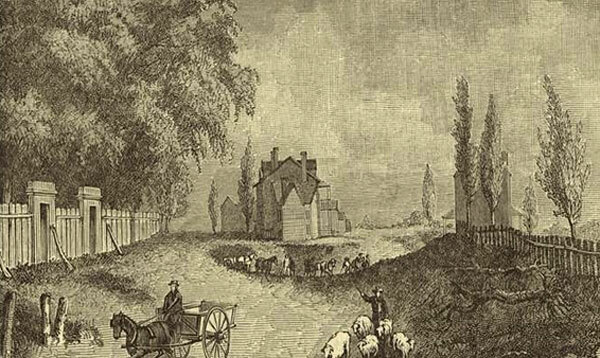 Bowery and Broadway in 1831 (later known as Union Square). Empty buildings in the Bowery (1973). The Liz Christy Memorial Garden. 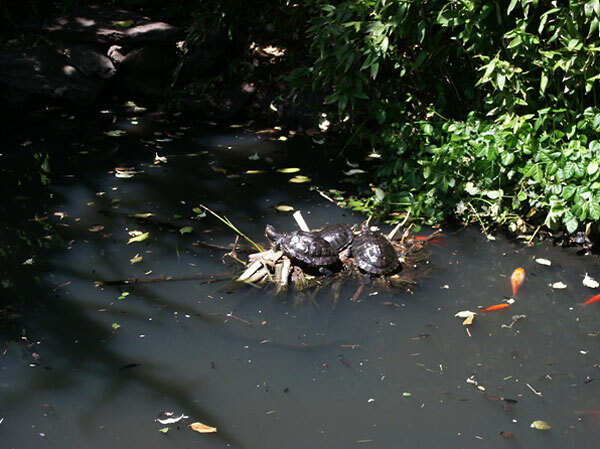 Turtles and goldfish in a garden pond. Tranquility in a bustling city. Proud gardeners display their bounty. Shared community awareness and commitment. Strong democratic institutions and genuine community participation are prominent in EcoTipping Point stories. Of particular importance is a shared understanding of the problem and what to do about it, and shared ownership of the action that follows. Communities move forward with their own decisions, manpower, and financial resources. The Green Guerillas, helped different neighborhoods to organize and design their own green spaces, depending upon their preferences (e.g., neighborhoods with many children or with many elderly people; or neighborhoods with ethnic groups who wanted to grow vegetables not available in local stores). Over the years it was discovered that gardens created by outside agencies (e.g. the Department of Housing and Urban Development) and then handed over to local residents fell into disrepair after a short time. Only those in which decision-making and leadership emerged from the community were successful. In contrast to public parks, people developed a sense of ownership in gardens where they themselves worked. People say to themselves, "I planted that tree, I put in that bench, I grew this zucchini." After community organizations were successful with gardens, they expanded their attention to many other projects to improve their neighborhoods. Outside stimulation and facilitation. Outsiders can be a source of fresh ideas. While action at the local level is essential, a success story typically begins when people or information from outside a community stimulate a shared awareness about a problem and introduce game-changing ideas for how to deal with it. Artist Liz Christy was a newcomer to the rundown Bowery neighborhood, and there was an influx of young college students seeking lower rents in an otherwise expensive city. Christy brought in a group of friends to help clean a single vacant lot and turn it into a garden. People had wanted to do something like this, but needed a "spark" to get it going. Once the community gardening movement was underway, Cornell University (New York's Land Grant college) provided technical support for expanding the gardening network. Enduring commitment of local leadership. Trusted and persistent leaders inspire the deep-rooted and continuing community commitment and participation necessary for success. The Green Guerillas were formed in the 1970s and still exist today. Christy's personality, dedication, and leadership skills were crucial to the organization's success in the early years. A broad base of leadership and community commitment was crucial for spreading gardens throughout the city during the following decades and saving the gardens by mounting a community campaign when New York City's municipal government tried to sell off the garden lots in the early 1990s. Co-adaption between social system and ecosystem. Social system and ecosystem fit together, functioning as a sustainable whole. Communities create a "social commons" to fit their "environmental commons." By working as a community, neighborhood residents were able to create a healthier urban environment. The idea of community gardens fit well with an urban population in need of green space and places to congregate and socialize. Many people were also unemployed and in need of work and healthy food. As the neighborhood ecosystem changed, people began to recognize it as a source of nutrition. As neighborhood quality improved, people began to take pride in it and dedicated themselves to improving it even further. Garden rules were important (e.g., no drug dealing, respect for others, maintaining an active garden in one's assigned plot, and using organic methods), as well as penalties for breaking the rules, which were mild for small infractions and stronger for more serious infractions. The gardens evolved to fulfill more social needs: food pantries, community organizing, stages for performances, classrooms. "Letting nature do the work." EcoTipping Points give nature the opportunity to marshal its self-organizing powers to set restoration in motion. Plants were chosen that grew well in New York without intensive artificial inputs. Manure from police horses and compost from local households provided natural fertilizers, ensuring high soil quality and making it unnecessary to use chemical fertilizers. While starting a garden is labor-intensive, once nature took over it produced many benefits that might have cost even more labor: reducing crime; providing food; improving environmental quality and the appearance of the neighborhood; creating a community meeting place. Rapid results. Quick "payback" helps to mobilize community commitment. Removing the garbage from a vacant lot and creating a green space took only a few weeks or months. Small, early successes, such as delicious food and attractive flowers, stimulated further efforts toward success. One growing season was enough to have an impact on the local neighborhood. A prominent article in the newspaper spread the idea, and other gardens began to spring up through local community effort. These in turn inspired others. The community garden movement spread to other U.S. cities (e.g., Boston and Chicago) and even to European cities (London, Paris, Rome). A powerful symbol. It is common for prominent features of EcoTipping Point stories to serve as inspirations for success, representing the restoration process in a way that consolidates community commitment and mobilizes community action. Liz Christy, a charismatic and energetic leader, became a powerful symbol of the Green Guerilla movement. The gardens became sacred spaces with an emotional attachment for the people who created them. They also became symbols of community pride and self-sufficiency. Overcoming social obstacles. The larger socio-economic system can present numerous obstacles to success on a local scale. Initially the "guerilla gardeners" were threatened with trespass charges and evictions for occupying vacant lots. To the city government, the concept of the public taking over property was alien. But the gardeners were able to rally public opinion and eventually to negotiate very affordable leases. Years later, when property values increased, developers began to eye the "vacant" lots, and the city started to sell them, the gardeners were able to form a coalition to secure the long-term status of most of the gardens. Later, federal funding and the city's Green Thumb program strengthened the community gardens movement. Social and ecological diversity. Diversity provides more choices, and therefore more opportunities for good choices. Because the gardens were managed by neighborhood organizations, they reflected the great diversity of cultures in New York City. The Hispanic gardens had chickens and goats; the Chinese gardens had religious symbols. 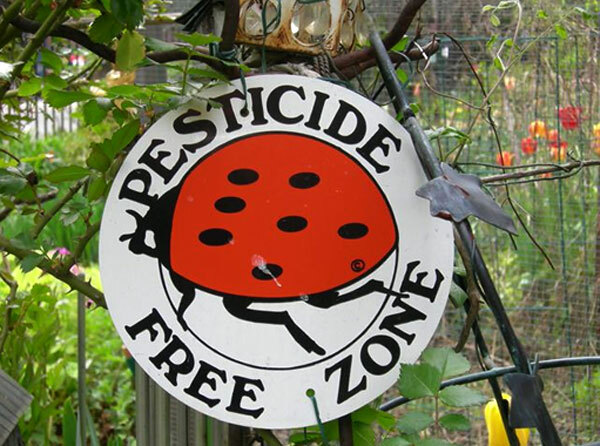 The neighborhoods also developed various approaches to problems such as garden pests. Ecologically, a more diverse landscape is more pleasing for the urban residents. Besides introducing a variety of useful and colorful vegetation where once only weeds grew, the gardens attracted birds and insects that served as pollinators for plants throughout the city. Social and ecological memory. Learning from the past adds to the diversity of choices, including choices that proved sustainable by withstanding the "test of time." For example, the early gardens in low-income neighborhoods reflected a diversity of cultural heritages. Immigrants from the Caribbean and African Americans from the South put their "social memory" to work, recreating gardens that featured the flavors of home. Not only farming techniques, but also skills that the gardeners brought from varied backgrounds – such as public relations, fundraising, teaching, law, and other professions – contributed to the gardens' success. Ecologically, the soil, which had been used to produce crops in earlier centuries, may have retained some of its agricultural capacity from earlier years. Building resilience. "Resilience" is the ability to continue functioning in the face of sometimes severe external disturbances. The key is adaptability. The gardens were sacred public spaces, where (unlike a vacant lot) it was "taboo" to dump trash. The community solidarity and social cohesion that developed around them allowed residents to defend their gardens and to take action on other issues affecting their neighborhoods such as crime and trash. A positive feedback loop developed in which better neighborhood quality led to more community pride and commitment, and attracted more residents. More people on the streets reinforced control of crime, illegal dumping, etc. and stimulated more shops to open, which in turn improved neighborhood quality. As some of the neighborhoods evolved from low-income to higher-income districts, the gardens evolved to include low-maintenance plants as a place to relax rather than grow food. When the city government started to sell off garden lots to developers, the gardeners had the experience, neighborhood pride, organization, and confidence to engage successfully in the public opinion and legal battles that saved most of the gardens. At the same time, a new virtuous cycle of “success breeds success” (shown in blue) arose around the garden, which served as a symbol for improving the neighborhood. The success of the garden, experience with managing it, and improvements in neighborhood quality instilled awareness, pride, and commitment to improving both the garden and the neighborhood even further. Most important, new virtuous cycles “locked in” the benefits. When property values in neighborhoods with gardens increased, the city government tried to sell garden lots for development. However, the pride and commitment of neighborhood residents, as well as experience and organizational capacity they acquired in the course of developing the gardens, enabled residents to take on the city bureaucracy, consolidating the legal tenure of the gardens. Laura Lawson, “City Bountiful: A century of community gardening in America. Urban community gardening is not a new phenomenon, although many elements of what is known as the ‘contemporary’ community gardening movement (starting from the 1970s until the present) are novel. The Depressions of the 1890’s and 1930s prompted many municipalities, including New York City (NYC) to encourage citizens to grow food on city land. Both world wars brought food shortages which spurred the Liberty and Victory Gardens. However, these were always seen as responses to temporary crises, and gardens were abandoned as prosperity returned. Modern community gardening, on the other hand, encompasses a rich complexity of overlapping needs and issues beyond simple production of food in lean times (such as public space, reclaiming the commons, urban food security, safety, and food justice). The 1970s saw a revival in urban gardening not only in NYC but all over North America. For example, there was the People’s Park in Berkeley, and the truck farm-turned garden in Seattle which later grew into an organization known as P-Patch. The postwar boom in suburban development had shifted much of the population to new communities encircling the city, causing a depopulation of older urban neighborhoods and resulting decay. There was an increase in demand for skilled jobs in the suburbs and a corresponding decrease in manufacturing and other blue-collar work in the cities. Segregation policies, discrimination and the centralized location of public housing and other services trapped lower income and visible minorities in the cities. Cities began to show the physical manifestations of neglect: tax-defaulted properties repossessed by the city, deserted buildings, and arson. As a result, New York and many other American cities at this time were characterized by an overwhelming number of vacant lots. With the fiscal crisis in NYC during the 1970s, overpopulated urban neighborhoods began to decay as businesses and residents moved out, draining the tax base of the inner cities, and reducing the number of essential services such as police and fire stations. This often went hand-in-hand with ‘redlining’, where banks or insurance companies refused to give loans or policies to would-be business owners in blighted neighborhoods. These neighborhoods became increasingly populated by African-American and Hispanic communities as well as students. They lived in neglected neighborhoods full of abandoned or repossessed vacant lots, many of whose buildings had been deliberately burnt down by owners desperate for insurance money. In NYC in the 1970s, it was estimated that the city contained over 25,000 abandoned lots. In the 1970s and early 1980s, landlords abandoned up to a quarter of the Lower East Side’s housing stock. These vacant lots were the vortices that drove the vicious cycles of neglect, violence, out-migration, increasing poverty, increasing crime, and decreasing interaction between neighbors. The lots became de facto dumps and attracted rats, gangs and criminal activity such as prostitution, drug dealing, and sales of stolen car parts. This was a disincentive for residents to be out on the streets which in turn further undermined the safety of the neighborhoods. Modern community gardening arose in the wake of the political activism of the 1960s, which saw student anti-war protests, the civil rights and gender equality movements, an emerging environmental ethic, and the back-to-the-land movement. The first Earth Day had been created in 1970, which lent higher visibility to the environment. There was also a movement of self-help housing, where urban ‘homesteaders’ or ‘squatters’ would move into abandoned or condemned apartment buildings, and mobilize as a community to make them as livable as possible. Often urban gardening was an integral part of these activities. The 1973 oil crisis caused food prices to rise which served as an even greater incentive to grow food. This grassroots political energy is what gave birth to, and sustained, the community gardening movement. In other words, the timing was right because of its ability to address a range of issues. The movement that began in NYC was known as Guerilla Gardening. Guerilla gardening is a political act that ties into environmental and social issues (such as land and squatters’ rights described above) and means taking over and creating a garden on an abandoned or underused piece of urban land not owned by the gardener. Other guerrilla gardening activities involve making ‘seed bombs’ which is mixing fertilizer with seeds into makeshift balls, which were thrown over fences or other off-limits areas to sow wildflowers or add greenery to vacant lots. The best-known narrative of the NYC community gardening movement originates with Liz Christy, the first director of the Green Guerillas who later became the first director of the Open Space Greening program for the Council on the Environment of New York City. Liz Christy had been politically active since the1960s, particularly with the anti-war and civil rights movements, where she learned the skills of community organizing, such as rent strikes, block strikes, and street basketball. She also ran an underground local monthly publication called Bleecker Times. Near the Bowery-Houston garden, Christy rented a space where she painted in oils on canvas, and where for eight years she ran a one-room school, teaching local kids geography and gardening, with a garden on the rooftop which grew herbs, fruiting crops and flowers. By the early 1970s, she was writing and giving workshops on gardening. Meanwhile, she was supporting herself in a variety of jobs at a trade publication, a law firm and public relations agency, where she learned other valuable skills she would put to use as a guerilla gardener. Noticing the needs and the resources (financial or otherwise), and finding creative ways to link them. As an artist, she brought her skills with design and composition to work with communities to create their own gardens through Green Guerillas and the Open Space Greening Program’s Plant-A-Lot project. Her background in public relations gave the early movement the visibility it needed. Christy had a studio in the neighborhood in the heart of the Lower East side. Walking through the neighborhood one day, she saw a boy playing inside an old refrigerator which had been dumped there. She dragged the boy out and took him to his mother, who reacted defensively, saying that she should do something about the state of the vacant lot. Christy assembled a group of friends and spent six to seven months organizing the time and labor needed to haul out the trash and clear out gravel from the lot. When they finally got to ground level, they found the dirt to be unusable. They collected horse manure from the nearby police station to supplement the soil, and planted seedlings in raised beds. After a year or so, the newly-created garden caught the eye of the city. Worried about liability issues, it threatened to bulldoze the garden. However, Christy was equipped with media savvy and contacts at local media organizations. She sent out press releases calling for a press conference, to which reporters from a variety of local newspapers attended. “The story was a public relations dream, and she really knew how to deal with the media,” says Donald Loggins, one of the original Green Guerilla members. Finally in April of 1974, NYC’s office of Housing Preservation and Development (HPD) granted approval to the group to rent it as the Bowery-Houston Community Farm and Garden for $1 a month. Sixty raised beds were planted with vegetables, and later trees were added. In its second year, the garden, which was later to be called the Liz Christy Community Garden following her death in 1984, won a neighborhood beautification contest sponsored by dress designer Mollie Parnis which also attracted the attention of other groups interested in transforming lots into green spaces. Following the media attention on the Bowery-Houston garden, groups from around the city were initiating their own guerrilla-style gardens on vacant lots. In 1974, Liz Christy and her collaborators formed the Green Guerillas (which formally became a non-profit in 1978), and they began sharing their labour, expertise, and cheerleading support with groups interested in following suit. Public radio was just getting started in NYC, and it was a new information venue that emerged alongside the grassroots environmental movement. Christy’s program on public radio station WBAI about urban gardening, called “Grow Your Own” was instrumental in sharing resources and knowledge about urban gardening. The gardens which arose at this time were rooted in the energy of urban self-sufficiency of the 1970s. The typical scenario began when interested community members came together, gathered resources, and undertook the labour-intensive tasks of clearing out a chosen site of its garbage, abandoned cars, and debris, and then removing asphalt and trucking in topsoil. Members caring for new gardens had to stay vigilant to prevent more trash dumping or other criminal activities which sometimes continued even after gardens were created. The emphasis with these early gardens was on creative optimization of resources, from garden-center surplus seedlings to horse manure from police stations. There was a strong ‘DIY’ (do-it-yourself) ethic to these early gardens – where in-kind donations or salvaged objects made their way into the garden design. A certain aesthetic began to emerge; for example, bathtubs or barrels as planting containers, forklift pallets for fencing and compost bins, bed springs as garden gates, wire spools as tables, and tires for retaining walls. Murals were often painted where gardens backed onto blank walls. At the very beginning, Green Guerillas was self-funded, and resources were borrowed, donated, or otherwise negotiated. They borrowed tools, brought in their own seeds, got manure from the police stations, and convinced the nurseries, at the end of the season, to give their leftover plants. Green Guerillas also distributed free trees, shrubs and other plant materials. One of the other early activities of the Green Guerillas was not just creating gardens but simpler ways of adding greenery and color to vacant lots. They planted window boxes and gave workshops on making ‘seed grenades’ or ‘Seed Green-Aids’ made with seeds, peat moss and fertilizer inside balloons or old Christmas ornaments which would be tossed into vacant lots that were wired off or otherwise inaccessible. The role of Green Guerillas, in these early years, was strongly rooted in the ethos of the 1970s. While informal and not highly organized (unlike the Green Guerillas of today), they saw themselves as a democratic grassroots movement who collectively contributed their unique skills to creating gardens. They embodied the idealism of the era which was hard to sustain as the movement matured, and Green Guerillas today has evolved to reflect this natural evolution. They acted as a source of volunteer labour to groups who wanted to convert vacant lots into gardens, a community resource for the nuts-and-bolts, and as cheerleader. Also, by looking at the diversity of gardens they were involved with in the early years, it is evident that Green Guerilla’s vision was to help others realize their vision, and simply provided the skills and volunteers – or ‘sweat equity’ – to support them in doing so. They were also instrumental in community-building by putting an emphasis on celebration. For example, after quarterly meetings or work days they would have a potluck. In addition to building community, it was a good way to promote gardening. Today, the Green Guerillas continue to work with gardening groups around the city not only with technical assistance but with effective organizing capacity building, conducting events, and coordinating services. They are also involved with advocacy, youth programs, and promoting urban food security through food-growing programs. 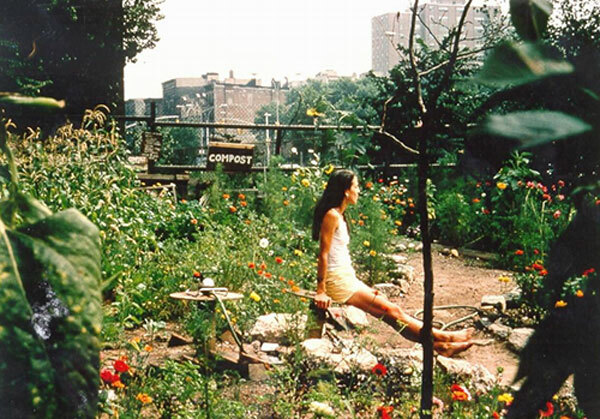 In the early and mid-1970s, gardens began to spread through the Lower East Side via word of mouth, the ‘spin-off’ effect (where groups were inspired to put in a garden in their neighborhood after seeing one nearby), stories in the media of other gardens in the city and around the country, and through alternative media such as Christy’s radio program. The main activities among new gardeners during this phase were gathering together enough volunteers for ‘work parties’ to do the labour-intensive work of preparing lots (clearing out trash and trucking in soil). With the challenges of acquiring horticulture skills, enlisting volunteers, and navigating municipal laws and liability issues, garden groups were on a steep learning curve. The need for information, technical expertise and outside support led to the emergence of garden support organizations, both non-governmental and governmental, which began to act as important ‘hubs’ on growing networks. While various support organizations that emerged during this time had overlapping functions, each had its own unique strengths and roles. Groups that were interested in putting in gardens ranged from ad hoc collections of neighbors, to more formally organized groups such as neighborhood or block associations, church groups, or schools. There were also a lot of ‘spin-off gardens’ – where one group would want to put in a garden after seeing a garden in a nearby neighborhood. Sometimes gardeners would expand gardens into newly-created vacant lots adjacent to them when the buildings occupying them were torn down. Many of NYC’s community gardens in the Lower East Side, Spanish Harlem, and the South Bronx contained small structures called casitas. The term casita (little house) is adapted from shanty houses constructed in the countryside of Puerto Rico, when many inhabitants were forced off their land as a result of the mass enclosure of the commons by large sugar companies soon after the island was colonized by the US in 1898. Although it was illegal to build the structures, there was also a law stating that if it was completed, it could not be destroyed. True to the spirit of the early community gardens, casitas tended to be constructed of scrap and salvaged materials, painted in vibrant colors, and were easy to take down, if necessary. The casitas themselves served either as tool-sheds or as indoor shelters for kids to play safely or for older people to gather for conversation or games. Jane Weissman, former director of Green Thumb, is credited for her advocacy of casita gardens and her instrumental role in protecting the gardens whose members followed her advice to adapt the structures to meet both building code and Green Thumb requirements. The approximately 500 casitas in gardens were a nostalgic symbol of cultural identity and self-sufficiency, and affirmations of community solidarity and a sense of belonging. Cultural or religious events, weddings, and festivals were held in these gardens. All garden members ‘owned’ the casitas, despite the strong association of casitas with the Puerto Rican and Dominican communities. Coalition and activist groups (Green Guerillas, More Gardens!, Neighborhood Open Space Coalition). Organizations provided a range of services, from technical or material assistance, site and materials acquisitions, organizational assistance and networking, and advocacy (working to put a green space agenda at the forefront of city issues). They acted as broker between the group and relevant city agency, to help navigate through red tape or bureaucratic hoops for which gardeners didn’t have the knowledge or resources. They were a centralizing agent for coordinating trash pickups, distribution of surplus equipment, or deliveries of manure or other materials. They were able to coordinate various groups in the creation of citywide gardening events, celebrations, or garden tours. 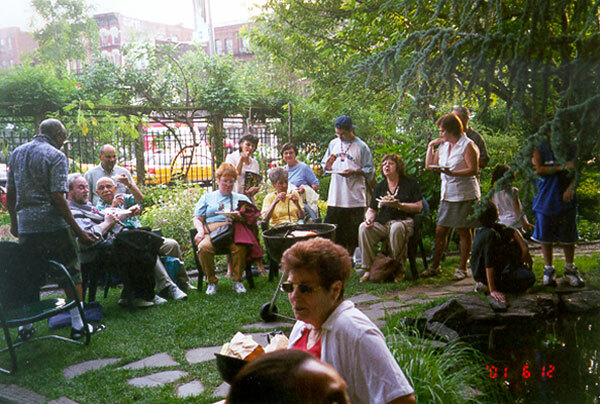 Networking strengthened collaboration among organizations and over the next two decades led to the formation of coalitions such as the Neighborhood Open Space Coalition and New York Restoration Project to protect gardens from development. The Council on the Environment of New York City (CENYC), founded in 1970, is a privately-funded citizen’s organization in the Office of the Mayor. It is a non-profit organization whose mission is to improve NYC’s environment in the areas of greening neighborhoods, supporting youth to become environmental leaders, and promoting waste reduction and recycling. In 1975, the CENYC created the Open Space Greening Program (OSGP), and Liz Christy was appointed as its first director. This allowed Christy to be paid to do full-time what she had been doing with Green Guerillas as a volunteer. The extra capacity and funding helped to leverage growth of new gardens. The OSGP provided on-site technical assistance to groups in all five boroughs. It also published practical, how-to information about leasing, site evaluation, composting, and improving the fertility of alkaline urban soils. It facilitated participatory design workshops, put up exhibits, and distributed seedlings when available. With ‘participatory site design’, the emphasis was about supporting communities to create open spaces that matched their needs and required their involvement. This is contrasted with other governmental programs (see in ‘Elements of Success’ section) which did not involve the community and as a result became abandoned after the site was created. After its formation, the OSGP added a Grow Truck Program. The Grow Truck is a mobile service which loans tools, donates seedlings and other garden supplies, offers gardening advice, and at the time of its creation, held a horticultural book library (although the book is now in the offices). The OSGP also created and distributed City Lot Fact Sheets about gardening, offered workshops and worked with other greening groups and city agencies on garden preservation issues. The OSGP got a boost through the support of a former investment banker’s family foundation. He had often noticed the vacant lots from the train on his way into Manhattan from Scarsdale, and began making inquiries into the possibility of transforming these derelict lots into green spaces. He came into contact with CENYC and Liz Christy, who at the time was director of the OSG program. With the additional funds from the Abrons Foundation, OSG created the Plant-A-Lot program in 1978. From 1981-4, Annual Reports list between 2 and 4 full-time staff and 3 or 4 part-time staff/consultants, who were mainly seasonal summer workers or specialists such as landscape architects or designers. In 1986, there were 17 gardens that were listed as Plant-A-Lot sites that CENYC had assisted with significant material and technical assistance, and had made a 3-5 year commitment to assist with maintenance and programming. Most of the sites were park-like in the sense that there was no food production, mostly because of concerns of presence of lead in the soil. The CENYC Plant-a-Lot program generally made significant capital improvements needed to take a moderate number of gardens who apply and are accepted, to the next level. It would facilitate a community design process, support them in raising the money to implement the design, and essentially ‘break through the resource barrier’ (finances and expertise). One of the distinguishing qualities of OSGP was its emphasis on participatory design and the aesthetic value of the gardens. It also gave importance to investing in better quality materials (such as wrought iron) for fencing, which lent gardens an air of credibility and permanence (in contrast with the standard chicken wire- and wood- fencing, which left gardens vulnerable to vandalism and gave them an air of transience). Today the OSGP has a full-time staff of five, continues to assist new gardens, and remains committed to existing Plant-A-Lot sites. As well, they have established a mapping project that maps gardens and trees, rainwater harvesting in community gardens, plant sales every spring, the Grow Truck service, and horticultural and garden construction advice to gardeners. By 1978, community gardens were starting to spread in low-income neighborhoods around the city and attracting attention from the media, but the groups lacked a sense of legitimacy. Few had permission to use the vacant land they occupied, and so were still de facto squatters. Up until then, the government resisted offering them protection because of liability issues. Operation Green Thumb was set up in 1978 by the Department of General Services. The largest community gardening program in the country, it is now under the NYC Parks Department and known simply as Green Thumb. By granting one-year permits to gardeners for $1, Green Thumb raised the gardeners’ status from ‘squatter’ to ‘tenant’. However, from its inception, Green Thumb was explicit about the fact that leases could only be granted on a temporary basis and the land could be made available at any time for demolition and development. Though the program gave them the recognition that gardeners needed, this allowed the City to evacuate them within as little as thirty days in order to develop the land. This would foreshadow the battles that ensued throughout the 1990s to preserve many of these gardens. In its first year, Green Thumb was staffed by one part-time employee who issued leases. Permission to create a garden on the land was given by a city-wide land use committee that determined the disposition of city-owned land (i.e., auctioned off, selected for housing/commercial development, or assigned to other agencies for open space, parking or other development). Leases were granted at a nominal fee ($1 per year) to community gardeners who requested land which had no immediate use. In the following year (1979), Green Thumb applied for, and received, its first federal Community Development Block Grant, which it still receives to this day. The Community Development Block Grant is from the US Department of Housing and Urban Development, which funds local community development activities such as affordable housing infrastructure and anti-poverty programs that have an emphasis on local participation. The funding allowed the program to hire more staff and provide gardeners with materials to develop gardens – such as fencing tools, lumber, outdoor furniture, soil, seeds, shrubs and bulbs. As well, it had the capacity to provide technical support in designing, building and planting gardens. Technical support was done in close collaboration with the Cornell University Cooperative Extension Program (see section on this program below). Green Thumb is available only to registered Green Thumb gardens with well-established structure and enforces basic guidelines which include public access, opening hours, events and programming, membership lists, ongoing maintenance, and keys. These guidelines were created so gardens would serve as community resources, accessible to anyone in the community who wanted to participate. For the first fifteen years of Green Thumb’s existence, there was little commercial development of vacant lots in NYC. By 1983, gardening groups began to see the need to actively preserve the long-term status of their gardens, and Green Thumb started granting five- and ten-year long leases to gardeners cultivating one-acre lots that were assessed at less than $20,000. In 1994, the City stopped approving new requests for Green Thumb gardens, and in 1996 it moved to sell off its entire disposable land inventory. Then in 1998, it began a policy of non-renewal of Green Thumb licenses and began auctioning off garden land. Garden groups had to shift gears from developing their gardens to fighting to protect them, and the struggle to save community gardens from being bulldozed has been well-documented. This phase of the movement is beyond the scope of this report, though more about this can be seen in the ‘Elements of Success’ section at the end. Established in 1948, the Cornell University Cooperative Extension program in NYC is a research-based educational organization. The program is a part of the university’s outreach and a ‘manifestation of its status as New York’s Land Grant University’. (The Land-Grant Act of 1862 was a piece of legislation which granted to each state some public land. Proceeds from the sales of these lands would be invested in a perpetual endowment fund to provide support for colleges of agriculture and mechanical arts in each of the states). In 1976, Cornell University Cooperative Extension was chosen by the US Department of Agriculture (USDA) to start a pilot Urban Agricultural Program. This was initiated by Congressman Fred Richmond, a Democrat from Brooklyn, who wanted to see support for existing gardens. The goal of the pilot project was to provide technical support to NYC’s backyard and community gardeners. The person put in charge of this was John Ameroso, a graduate of agronomy and agriculture who had recently returned from time spent overseas on rural development projects with small farmers in Southeast Asia. Ameroso was chosen as head of the program in Brooklyn, and the only hands-on staff member during the pilot phase of the project. His job was to assist groups who wanted to put in gardens, through workshops, outreach and technical support. Some of the land grant money went into supplies such as seeds, soil, or inexpensive fencing materials. The pilot project’s success led to the formal launch of the program in 1977, with $1.5 million initially provided to set up urban offices and garden projects in six cities, one of which was NYC. In NYC, one staff member was assigned to each of the five boroughs. In 1978, the funding was expanded to $3 million. The program’s success led to its spread to 23 cities at its peak, with programs in other cities varying in their type of programming and level of involvement. USDA funds had to go through a land-grant educational institution, which in this case was Cornell University. Staff members of this Urban Garden program were not necessarily associated with the university as faculty, students or alumni, though there were connections and information sharing among them and the university itself. As a result, Cornell University’s College of Agriculture and Life Sciences established the Urban Horticulture Institute in 1980, whose mission was to research ways to enhance plant functions within urban ecosystems. 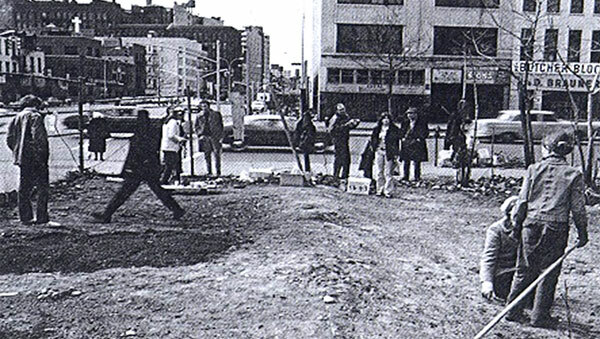 The start of the CUCE Urban Gardening program, along with the work of Green Thumb, Green Guerillas, and CENYC, had a strong role in the early expansion of gardens. A social network began to form among the CUCE Urban Garden staff members as well as staff of other support organizations. A regular social gathering called ‘green drinks’ brought people together to socialize, celebrate, and share information. This played a large role in the strengthening of the community gardening network in NYC. The work of CUCE was primarily horticultural and technical support, outreach, and cheerleading. A lot of the early work between CUCE and Green Thumb involved site visits, coordinating workshops on-site, or attending community meetings in an advisory/consulting role where a garden was being planned or in progress (for example during work parties). They would also go to places as support staff where a community was out in the garden on a work party. They attended youth programs in the summer, and offered assistance at school programs where schools had gardens. They also did teacher training, or were otherwise involved with the youth component of some gardens which had one. Unlike OSGP and Green Thumb, their emphasis was on gardens once they were in place. The focus was more on plants, soil and seeds and less on participatory site design. CUCE Urban Garden program also did horticulture education through ‘fact sheets’ and a newsletter called “Gotham Gardener” which had, among other valuable tips and information, a calendar for choosing different crops suitable for local conditions at different times of the year. This calendar was enduring and comprehensive and has continued to be used in various other organizations’ outreach and educational literature. CUCE collaborated closely with Green Thumb in various ways described above, as well as co-organizing two successful events. The Grow Together conferences are annual one-day events which began in 1983, where gardeners from around the city attend workshops held by experts from various support organizations on topics ranging from community organizing to horticultural practices. Harvest Fairs, or Harvest Festivals, were popular one-day events held at the end of summer. They featured multi-category fruit/vegetable competitions, cooking competitions, live music and other events. As the number of Urban Garden Programs spread to other cities, Cooperative Extension staff members would hold meetings around the country to share resources and information. Meetings like these helped to lead to the formation of the American Community Gardening Association, described later in this report. Though there were hopes to expand the Cooperative Extension Urban Garden program to all fifty states, political support for it was weak, and a cap of $3.6 million was placed on the budget even as the number of cities served was increasing, which meant funds were stretched increasingly thin over the years. It was not in CUCE’s mandate to raise funds, and funding dried up 1994. CUCE was then reorganized, with some existing staff members absorbed into other programs in a similar capacity. Founded in 1972, the Trust for Public Land is a national organization with nearly a dozen regional offices around the country. It is the only national non-profit organization whose entire focus is to acquire and protect land for public access. To do this, it often uses innovative models from private business that it then passes on to its private partners or local land trusts. TPL does not own land, but acts as a third party in independent public negotiations to secure land. Its emphasis is on land in or around urban areas where fluctuating prices and encroaching development makes the protection and acquisition of public land the most challenging. TPL’s “Parks for People” project started In NYC with the goal of maintaining access to open space for its inhabitants. Even though TPL is more associated with saving NYC’s gardens than creating them, they played an important role as early as the late 1970s. It had started out helping some neighborhood groups in Berkeley secure derelict land and then decide as a community what to do with it. In 1978, they came to NYC, and for the next four years, they helped a dozen groups legally acquire land as ‘single site land trusts’ or other strategies to secure long-term control. They also began trying to influence municipal policy in favor of securing surplus city-owned land for local open-space access, and helped about a dozen groups secure land from the city for local open-space use. But TPL really became a major player in the community gardening movement with the innovative agreement to protect Clinton Community Garden in 1983. Located in Hell’s Kitchen in Manhattan, the city put Clinton Community Garden on restricted sale with a starting bid of $900,000. In response, TPL joined forces with Green Guerillas, Housing Conservation Coordinators and the gardeners themselves to ‘sell’ $5.00 parcels of land. Though they were only able to raise $125,000, the activity brought the public spotlight on the story, and as a result, the city finally agreed to preserve the lot by transferring it to the Parks Department. TPL organized a land trust called the Clinton Community Garden, Inc., which signed a long-term agreement with the Parks Department, and the $125,000 that went into an endowment fund to cover future expenses. This innovative move by TPL was an oft-cited precedent, and marked the beginning of more concentrated efforts by TPL in the 1990s to protect gardens from demolition. In total, TPL has invested in more than $200 million in land purchases and in the design, construction and stewardship of these green spaces. It owns 64 community gardens throughout NYC, which were saved from a city auction and destruction for development. To do this, it worked alongside community gardeners to transform vacant lots into green spaces. It has purchased land to permanently protect it, and then provided design and development assistance (including physical improvements, such as watering systems, fences, and gathering spaces), organizing assistance, stewardship services, grant writing, environmental education and programming. It works at the level of community organizing, building self-management capabilities of local gardeners and helping to connect them with other local institutions (schools or churches) to broaden public use and create partnerships. It also assists with property management, addressing basic issues of ownership, such as maintenance, encroachment, legal actions, insurance, and consolidation of ownership of in-holdings or adjacent lots. It also has children and community programs, helping to bring school children into gardens for field trips or green education, as well as developing arts or science summer programs for children. It provides small grants and technical assistance to introduce music and art programs to engage children and the larger community they are connected to. In 2004, TPL set up three new non-profit organizations to ultimately own and manage the gardens: The Manhattan, The Bronx, and The Brooklyn-Queens Land Trusts. These three combined make up the country’s largest land trust protecting community gardens. As time passed, other organizations to assist gardeners began to emerge in addition to Green Thumb, Green Guerillas, CENYC, and Citizens Committee for NYC. For example, there were, among others, the Neighborhood Open Space Coalition, the Trust for Public Land, The Horticultural Society of New York, Brooklyn Botanic Garden/ Brooklyn GreenBridge, New York Botanical Garden/Bronx Green-Up, Magnolia Tree Earth Center, More Gardens!, New York Botanical Garden, New York Horticultural Society and Trees New York. This list is not exhaustive, and there are many other foundations and organizations directly or indirectly involved with supporting NYC’s community gardens. Municipal and regional national networks led to the creation of the American Community Gardening Association (ACGA). In New York and other cities, the movement began to branch out from organizing and technical support into the realm of lobbying and advocacy, pushing for a stronger open space policy on the municipal agenda. Activities around policy and advocacy relied on results of research that was both informally and formally conducted through various task forces, individual university students, student interns, and support organizations. As the community gardening movement became more established, it became clear that simply knowledge of horticulture was not enough to successfully maintain a community garden. Other skills, such as navigating local politics, land acquisition options, liability insurance, business administration and public relations were becoming increasingly important. It seemed important to pool all the resources under one centralized body which would support gardeners across the country and make best use of resources already out there, so that new groups were not constantly re-inventing the wheel. ACGA is a product of two national community gardening conferences organized by the City of Chicago Department of Human Services in 1978. At that time, Chicago had well-developed gardening programs and saw the need for information-and resource-sharing among community garden associations around the country. Approximately 150 organizers and activists attended, including Cooperative Extension Urban Garden staff in various cities. These conferences also helped to create a foundation for a national network of urban gardening organizations. It was at this first conference that creating a national community garden organization was suggested, and a small group of organizers volunteered to focus on developing the idea. Chicago hosted a second conference in 1979, where the American Community Gardening Association was officially founded. The mission of the organization was to promote community gardening, to provide networking opportunities between garden organizations, to create an information clearinghouse, and to support new programs being established. The forty-nine charter members from twenty-two states represented garden organizations, cooperative extension programs, public agencies, horticultural societies, and universities. By 1983, the ACGA had 150 members – both organizations and individuals – comprising a network of 1,200 community garden organizers who in turn represented many more gardeners. convening workshops and conferences for program coordinators. By the end of 1982, ACGA gained status as a non-profit 501(c)(3) organization with a grant from the Pennsylvania Horticultural Society in Philadelphia. It has a 16-member board of regional directors established to provide more locally-appropriate contact points around the country. Through its annual conference, the ACGA has been a venue for garden activists across the country to share information and build relationships. Conference presentation topics are diverse and range from themes such as site location and preparation, garden design, children’s gardens, food delivery systems, and plant therapy. The ACGA also started a quarterly journal in 1982 called ‘Community Greening Review’, which continues to be a major source of information. In response to requests at the annual conferences, the first four issues surprisingly addressed not horticulture, but funding, land acquisition, special population groups and community development. In part, the formation of the ACGA is a logical progression from annual meetings among cooperative extension staff members from around the country and represents an upward shift in scale from local to regional to national and beyond. The ACGA has members in Canada as well. The management and organizational structures of gardens vary from site to site, depending on the needs, demographics and the size and resources of the membership. While starting a communal urban garden may seem simple, as described above, there are various logistical, horticultural, legal and organizational issues to consider. Some gardens were started by established organizations, such as schools, churches, tenant’s associations, universities, gardening clubs, service organizations, and other institutions. The value of this was that the garden could plug into existing social infrastructure and could provide a venue for existing members to emerge as leaders. Gardens are generally self-managed, with participants working together to address ongoing matters such as plot assignment, paying for water and liability insurance, and making sure the site and tools were in good condition. In some cases, everyone wanted to be involved, which meant regular meetings to assign tasks; in other cases, gardeners just wanted a site to garden. In any case, they needed some system of communication among them. Bulletin boards, newsletters or mailboxes at each plot were common ways to do so. As the garden became more established, policies on fees, maintenance standards for individual plots, care of communal spaces, compost management, acceptable gardening practices (some groups required organic gardening practices in all plots, while others took a more hands-off approach), and codes of behavior had to be determined. Most programs collected nominal fees for plots, to cover insurance, water, and shared materials. Many groups created rules on maintenance of shared paths, watering, and mandatory plot cleanup after the final fall harvest. Because many gardens had waiting lists of prospective gardeners, most groups also developed procedures to reassign neglected plots after a grace period had passed. Management included regular meetings, elections, garden rules, a bank account, bylaws, a Board of Directors, officers, multiple leaders, committees, and (for some gardens) non-profit 501(c)3 status. There were also activities in the gardens that required administration, such as hosting festivals, fundraisers or cultural events, as well as educational, cultural, or youth programs. These usually began to develop after the garden had become established and a solid local organizational structure was in place to administer them. A place for members to meet is important, especially in the beginning of a project. Many groups have community rooms where residents can hold meetings to plan the project in its initial stages. Once the garden is in development, safe and accessible storage spaces for tools becomes important. For community gardeners interested in publicizing garden events or programs, they need access to office equipment such as copiers, fax machines and computers. At the beginning, in approximately 1978, there were about seven women who got together to transform a vacant lot on Bainbridge Street into a community garden. It was a vacant lot surrounded by buildings in poor condition which have since been rebuilt/renovated. “There were no men to help us,” explains Mary Jones. About four people were first involved, and they were members of the Central Bainbridge Block Association. At the time, the block association was involved with attending community meetings and pursuing issues of safety and accountability related to uses of the apartment buildings. One of them asked Mary to join in creating the garden, and she did. When they got serious about putting in a garden, they had to ‘get on the case’ of the sanitation department to clear out the trash. They went to work on the garden using their own materials. They leveled it off and then put in 8 by 4 foot boxes which they later rented out for $10 a year. Then they became leaseholders of the land through Green Thumb, who gave them soil and other materials, such as gloves, tools, and other supplies. The first fence they had was turkey wire given to them by Green Thumb. It was promptly stolen, and Green Thumb gave them a chain-link fence, which remained there until 2000 when Trust for Public Land got involved and gave them a major boost in capacity. The garden began to attract people and interest when they put in the boxes to house garden beds. The presence of the block association ensured that some of the garden members would always have regular contact with each other. In the early days, work on the garden was decided informally. ‘Work parties’ were arranged informally when enough of a group of people were working in the garden. As time passed, they began to hold more formal meetings in the garden, where people had brought old couches. They usually met during the growing season, but if there was reason to meet in the winter, or on hot days, they would go to a nearby fast food place instead. The block association acted as their treasurer, bank account, and channel for grant proposals because it already had non-profit status and could receive the money (the garden became incorporated much later). The presence of the garden and the ‘eyes on the street’ helped to bring more accountability to criminal activity and made it safer for children. Green Thumb gave them the most support in the early years. In 1999, the garden became subsumed into the Brooklyn-Queens Land Trust and got a major boost in support and capacity from Trust for Public Land. For example, with TPL’s assistance, they were able to dig deeper into the soil to make sure there were no contaminants, hauled out the old soil, and trucked in fresh soil. The garden received one of the first gazebos from TPL. Now they have to go through the Board of Directors of the BQLT for any major issues or decisions. Operations at the garden have become much more organized and improved as a result. They have various social events in the garden. For example, they show films (using electricity from a neighbor’s house), and they have cook-outs, fish fries, and live bands as well. Washington has been involved with the Garden of Happiness since its creation 23 years ago. Three years earlier, in 1985, she had moved into a house in the South Bronx with her two children. Across the street was an empty lot full of abandoned car parts, rubbish, old mattresses, and weeds. “When people see garbage in your neighborhood, they also see it as a reflection of you,” she says. At first, they arranged to have the Department of Sanitation come and clear out the trash. Sanitation needed a dump truck and other heavy machinery to clear it out and level the ground. At that time, the Brooklyn Botanical Gardens’ Bronx Green-Up program had just been set up to support garden organizations. They were very helpful to these early Garden of Happiness members, as was Green Thumb. When the lot was leveled, Green Thumb came in with soil and lumber to make boxes for garden beds. Bronx Green-Up brought in trees from the Botanic Gardens. Roles for the operational management of this garden began soon after its creation. Jose Lugo became the de facto person-in-charge of the garden and Washington acted as his assistant. Together, they ‘felt their way around’ the first year, coordinating the work of clearing out trash and bringing in soil. As well, they began basic administrative duties such as securing the lease from Green Thumb, getting the contact information of people who wanted to rent plots, keeping track of keys to the garden, and taking members’ money for the plot rentals. Towards the end of the first year, Lugo was the garden’s first official president for the first two or three years, and after that Washington took over as president. In the first few years, they started out with two roles: president (who would assign plots and take member’s money) and a treasurer (who would hold the money in a bank account). As time passed, the role of foreman was created. Today, two foremen are part of the garden operations. They take soil deliveries, care for the garden’s resident chickens, and do general maintenance, such as lawn mowing or pruning. All other members are required to share certain duties in the garden, such as turning the compost, watering or other maintenance duties. Today, Washington is no longer involved with day-to-day operations in the garden, though she acts as the garden spokesperson, writes grant proposals and sometimes gets involved with conflict resolution. The garden holds monthly meetings during the growing season. The most important meeting is the one held at the very beginning of the growing season to determine which members who had plots in previous years will be returning for the coming year. Plots of previous members who have not renewed their claim by Mother’s Day will have their plot opened up to newcomers. Plots started out at $10 per year, and today plots are $30 a year, with money going to maintaining the garden’s portable toilet as well as for administrative expenses and events. In terms of capacity building and technical support, the garden has received help from other support organizations besides Green Thumb and Bronx Green-Up. Washington cites Trust for Public Land as particularly instrumental in helping them deal with conflicts among members. At this garden (and possibly others), common types of conflict include the occasional members’ reluctance to allow ‘outsiders’, such as non-members, access to the garden. Other conflicts might arise over differing standards of acceptable behavior in the garden (such as drinking or stealing produce). Trust for Public Land assisted the group to deal with the conflict as a group. In other words, even if the issue involved certain individuals, it would be brought to the level of the entire garden membership and decisions about it made as a group. The demographics at the Garden of Happiness have shifted significantly since the garden’s inception. Each new wave of immigrants has been able to plug into the established structure of the garden. At first, the majority of the residents were southern African American who raised collard and mustard greens, kale, cucumber, potatoes and string beans. Then many Puerto Ricans and Dominicans moved into the neighborhood, growing pumpkin, hot peppers, and cilantro. By the late 1990s, many Mexicans were arriving, and they grew corn, cilantro, tomatillos, and popallo (a Mexican herb). Over time, the garden also developed other stewardship activities such as keeping chickens and harvesting rainwater. Since the Garden of Happiness was the first garden with which the newly created Bronx Green-Up worked, they often gave horticultural workshops in the garden, on topics ranging from landscaping to pruning. As time passed and skills developed, the gardeners themselves held workshops, and the relevant issues changed with the passage of time. Among many gardens the focus shifted towards nutrition and urban food security. As a reflection of this, organizations such as Just Food have held workshops on canning and cooking. The threat of eviction as a mobilizing force to the movement. Although details about this phase of the movement are beyond the scope of this report, the direction began to shift in the mid-1980s from transforming vacant lots to securing the gardens’ long-term future. As a result, this helped to bring garden groups together and begin strategizing on a larger scale. As mentioned earlier, Trust for Public Land, and to some extent CENYC, were the only organizations which focused on the gardens’ long-term status from the movement’s beginning. While the crisis in the 1990s under Giuliani diverted gardeners’ attention from making their gardens better to battling for their survival, the effect was that it galvanized gardeners into a citywide ‘movement’ with a collective voice. As well, it was the impetus for many groups to expand their outreach and establish new educational and cultural programs as part of their lobbying strategy to demonstrate the garden’s value as a community asset. Occasionally, alliances formed between community planners and the local garden coalition in order to reach an agreement that protected the garden. Social organizing and networking were as important as gardening skills. While many staff members in the garden organizations of the early 1970s and 1980s came to community gardening through horticulture, they soon learned that gardening knowledge was secondary to skills in building relationships and social organizing. While the work required competency in gardening, it also called for an ability to work closely with diverse groups in diverse urban settings. It meant taking the time to build relationships, to have celebrations and other social events where those effective working relationships would develop. The importance of leadership succession. Garden group members vary in their level of involvement, but all groups are held together by ‘core members’ who can be broken down into core leaders and supporting leaders. In a study conducted during an internship with Green Thumb, Marguerita Fernandez found that gardens most able to sustain themselves in the long term were organizations which had more than one ‘core leader’. She writes: “The existence of multiple leaders is a key element to ensure leadership succession.” Several core leaders and supporting leaders would give the resilience to withstand changing circumstances where supporting leaders would step into core leadership positions. One example which highlights this was the establishment of the HUD (Housing and Urban Development) garden program between 1976 and 1982 at a cost of $3.6 million under a Community Block grant (which also supports Green Thumb). Sites were identified, designed and created by agency staff without involvement of locals, despite the assumption that they would take over maintenance of the sites once they were completed. However, many sites simply went into disrepair and the program was later revised to plug into existing organizations with those neighborhood connections in order to encourage a more sustained level of participation. Another lesson came out of a project created through a federal funding initiative by President Jimmy Carter, who had visited the burned-out neighborhoods of the South Bronx. The money went into the creation of approximately fifteen gardens and the South Bronx Open Space Task Force was created to coordinate the efforts of federal, state and city agencies, non-profits, and citizens involved. The results of the program were mixed, and seemed due to the attempts to mix grassroots activism with the complexity of bureaucracy. The central role of local community. The gardens belonged to the communities that created, developed, and tended them. Creating gardens inspired communities to seek out more tipping points to provide even better services from their social and ecological systems. The sense of ownership and communal investment in a garden gave community members opportunities to discover leadership potential as individuals, and motivated them to address other issues affecting their blighted neighborhoods. Success breeds success. Their involvement and success with the garden allowed them to ask: “What else can we do?” The corollary of this is the failure of projects which were imposed on the community without local participation. These symbols create community spaces, shared community ‘stories’, or other means that symbolize the ‘tip’ and mobilize community action to carry it forward. Just as vacant lots symbolized decay, neglect, and crime, the gardens became symbols of self-sufficiency and community pride. Gardens were sacred public spaces, where it would have been considered ‘taboo’ to dump trash or otherwise violate the gardens. EcoTipping Points draw on social and ecological memory as a resource. When gardens were first being put into vacant lots in the 1970s and 1980s, the dominant cultures of these low-income neighborhoods were Puerto Rican, Dominican, African Americans from the South, and Caucasian artists and activists. Many of the older gardens reflect these cultural heritages, contrasted with those of native New Yorkers who would have had less exposure to growing food. Gardens were also symbols of community pride and self-sufficiency among communities that were marginalized in their countries of origin as well as their new homes. The casita gardens are a good example of the Hispanic cultures of growing food, family, community, festivals and celebration. In “Tales From the Field” (see Sources below) one Puerto Rican gardener writes: “My garden is actually a piece of Puerto Rico, but in New York.” Another writes: “With this garden we bring back to Hispanic people that feeling of Puerto Rico, the working hard feeling working in the soil again.” This ‘social memory’ was a valuable resource because urban dwellers who lived in the city were not likely to have these skills and would have to seek them out from support organizations. The gardens were an opportunity for these ‘new New Yorkers’ to plug their skills and knowledge into a new context, and create thriving gardens rich with cultural diversity. By bringing their horticultural skills and knowledge from the ‘outside’, this social memory is a source of diversity that enriched the ‘urban ecosystem’ and served as a powerful resource for NYC’s community gardening movement. Ecological and social diversity provide greater functionality. The gardens were a source of biodiversity in the urban ecosystem, providing valuable services and stimulating a commitment to continuing them and developing them further. Birds attracted and supported by the gardens fostered a sense of wellbeing (biophilia), and insects from the gardens, such as butterflies and bees, served as pollinators for plants throughout the neighborhoods. Diversity of food production from the gardens provided a diversity of nutrition for the gardeners. NYC’s community gardens are well known for their social diversity – a vast range of cultural and educational activities, from sculpture exhibits and dance or theatre performances to events such as weddings, youth mentorship programs, and many other innovative projects. The gardens which ventured beyond horticultural activities created more ‘points of entry’ to attract diverse people of different ages, different educational levels, and different interests. This fostered inclusion and opportunities for individual expression, and was part of the long-term success of a garden. EcoTipping Points enhance resilience, to ‘lock in’ the gains and withstand unexpected perils. When the gardens began to add value to previously unwanted land, they also helped to push up property values, which attracted developers—and the threat of demolition. However, groups had invested their time, sweat, and love into their garden, developing vision, leadership and organizational skills along the way. As a result, they were much more able to mobilize the legal actions to protect them. Although these contentious and protracted battles resulted in the demolition of some 300 gardens, for many more it led to their long-term tenure. After putting so much of themselves into these common spaces, groups developed the confidence to take action not only on the gardens but on other issues affecting their neighborhoods. In this way, residents were creating neighborhood in which gardens were an integral part, and where not having one was unimaginable. EcoTipping Points lead to small, early successes, which stimulate further efforts towards success. Early results are powerful ‘reinforcers’, and are necessary to sustain momentum and inspire people to invest even more time and energy towards the project. After the task of clearing out trash and laying down soil was complete, one growing season was enough to have an impact. The visual impression created by seeing a functioning garden where a few months ago was a vacant lot full of crumbling concrete, weeds, and trash would inspire, encourage, and motivate residents towards further success. The ‘demonstration effect’: Ecotipping Points ‘scale-up’ by replicating local success. Nothing creates a visual impact quite like the sight of a green oasis in the middle of crumbling concrete where a junk-filled lot used to be. The Lower East Side is full of ‘spin-off gardens’, which were created after being inspired by neighboring examples. People would not have started the gardens if they had not first seen another garden and realized that such a feat was both viable and feasible. After mobilizing the labor to create and maintain them, newly protective neighbors made sure that gardens would not promptly fill up with trash again, or continue to attract vandalism or other criminal activity. The replication spread. People who saw gardens in other neighborhoods – or read stories in the media – began the process of conversation, inquiry and experimentation that led to similar creations in their own neighborhoods. This led to demand for support organizations that would offer expertise and resources, which led to growing networks that ‘scaled up’ to citywide, statewide and finally nationwide scale with the formation and expansion of the American Community Gardening Network and the Sixteen Cities Cooperative Extension programs. EcoTipping Points are efficient because they frequently transform ‘waste’ (such as degraded/abandoned land or buildings, sewage, garbage, or marginalized populations) into valued material and social capital. Not only were gardens built on derelict land, gardeners often made creative use of donated or salvage ‘waste’ materials such as old tires, scrap wood, horse manure, or nursery surpluses. Gardens flourished in low-income neighborhoods with high unemployment rates and engaged at-risk youth, the elderly, and new immigrants. They harnessed the frequently-overlooked energies and talents of local tenants and residents, and created conditions for the emergence of local leaders. EcoTipping Points are efficient because they mobilize nature and natural social processes to do the work. While it was initially a labor-intensive job to mobilize people to clear out trash and put in soil, it set in motion a broad range of consequences. The garden became the focal point around which the community could rally. By focusing their energies on a project that addressed a variety of local issues, they were able to achieve results that exceeded results attained by micromanagement or more conventional, costlier approaches, such as barbed-wire around lots or top-down neighborhood beautification projects. Other programs were able to piggyback on the social and physical infrastructure created by the garden. In this way, the garden became a valued resource that other community projects could plug into. The larger system can place competing demands on people’s time, attention and energy. People become dependent on others who do not deliver reliably. Powerful persons may try to take over assets newly created by local communities. By occupying vacant lots as ‘guerilla gardeners’, local community members were making their own decisions instead of waiting for decisions to be made by an unresponsive bureaucracy with its own political agenda. And they overcame the city government’s alarm when they occupied the lots. Once gardens began to flourish, the growing movement began to negotiate legitimacy through temporary leases with the help of Green Thumb. And when their tenure was threatened by the city starting to sell their lots, they had gained the skills and capacity to ‘scale up’ and form coalitions to secure the long-term status of most of the gardens. Been V, and Voicu, I. “The Effect of Community Gardens on Neighboring Property Values.” New York University, 2006. Elder, R. F. “Protecting New York City’s Community Gardens”, October 2005. Endicott, Eve. “Land Conservation through Public/Private Partnerships”, 1993, Island Press. Enterprise Foundation report. “Neighborhood Greens: A Guide for Community-Based Organizations”, 2002. Fernandez, Marguerita. 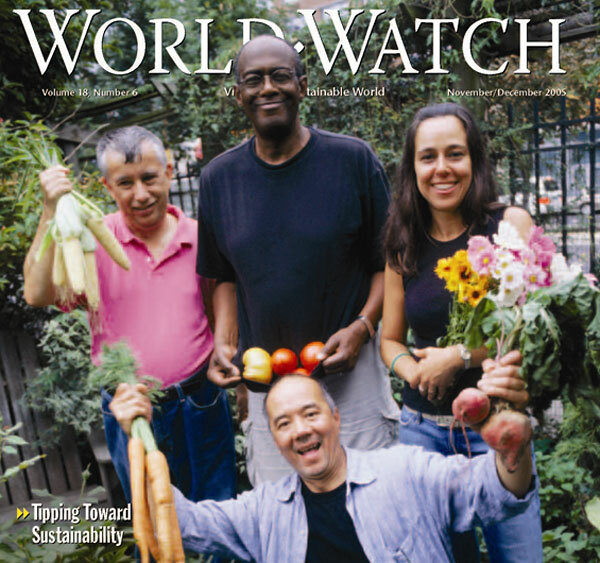 “Cultivating Community, Food, and Empowerment: Urban Gardens in New York City”, 2003. Howard, Jerry. “Inscrutable Policies of Changing Grey to Green.” Whole Earth Times, May/June 1980. Lawson, Laura. “City Bountiful: A century of community gardening in America”, University of California Press, 2005. Stone, Andrew. “A History of Open Space in New York City”, New York City Open Space Task Force, 1985. Weissman, Jane (editor). “City Farmers: Tales from the Field”, vols I and II. Department of General Services, Green Thumb, 1990 (vol. I) and 1996 (vol. II). Interviews with Donald Loggins (former member of the Green Guerillas), Lenny Librizzi from (Council on the Environment Open Space Greening Program), Andy Stone (Trust for Public Land), Jane Weissman (former director of Green Thumb), John Ameroso (Cornell University Cooperative Extension), Mary Jones (Brooklyn Queens Land Trust), Karen Washington (co-founder of garden coalition La Familia Verde), and Steve Frillman (Green Guerillas). The largest urban ecosystem in America provides a dramatic demonstration of EcoTipping Points and feedback loops at work. The thirty-year saga of the New York City community gardens suggests that an EcoTipping Point can be an effective urban renewal program, at a fraction of the typical cost. It shows how the spinoffs from a single catalytic action can help to tip an urban neighborhood and an entire city from degradation to restoration. And it illustrates how those spinoffs can sometimes create opposing spinoffs, pushing the eco-social system into a tug-of-war. As longtime gardener Donald Loggins sums it up, "One person, at the right place at the right time, set a whole bunch of stuff in motion." The right time was 1973 and the right person was a landscape painter named Liz Christy. She had a studio near the corner of Bowery and East Houston, in the heart of Manhattan's Lower East Side. The Bowery had tipped in a negative direction decades before. Back in the 1600s, it had marked the southern end of a farm owned by Peter Stuyvesant, the last Dutch governor of New Amsterdam. The very name "bouwerie" was the Dutch word for "farm." In the 19th Century, the neighborhood had become a lively launching pad for immigrants fresh from Ellis Island. But the 20th century had brought decades of disinvestment by the city and neglect by landowners, until the street's name had become synonymous with skid row. It was studded with flophouses for winos. The low rents attracted a few artists like Christy. Meanwhile, the poorest residents squatted in abandoned tenements and panhandled on street corners. In the vacant lot at the northeast corner of Bowery and East Houston, two homeless men had frozen to death in a cardboard box the previous winter. The Bowery reached an environmental tipping point one evening, when Christy was walking past the corner and saw a young boy playing in the garbage that littered the lot. The boy was about to climb into a discarded refrigerator and pull the door shut behind him. Christy was horrified. She pulled the boy out, dragged him to his mother and scolded her for letting him play in the trash. The mother didn't take kindly to the reprimand. She responded that she had a house full of kids to watch. If Christy was so worried about the refrigerator, why didn't she get rid of it? In short order, Christy assembled some friends and some tools and started cleaning out the dump. The group had already experimented with tossing "seed grenades" into vacant lots: Christmas ornaments and water balloons packed with seeds, compost and water. Now they hoped to reclaim an entire strip of land. They hung a sheet on the fence and wrote, optimistically, "Watch this plot of land be turned into a garden in 24 hours." It took more like three months. "We thought it was kind of crazy," recalls Loggins, a member of the original group. "You didn't want to go into this neighborhood. One time, when I was helping here, I heard gunshots. None of us envisioned we would be here 33 years from now." After hauling out six feet of trash and leveling the gravel underneath, the group trucked in soil. They marked out sixty raised beds and gathered horse droppings, from a nearby station for mounted police, for use as fertilizer. They planted seedlings scavenged from a park department giveaway. The neighbors, overwhelmingly African-American and Hispanic, were at first suspicious of a passel of Anglo kids in hippie clothes. But as they saw the Bowery Houston Community Farm Garden take shape, local teens pitched in. Within a few months, they were taking home armloads of tomatoes and cucumbers. City officials were less enthused, and made noises about clearing out the horticultural trespassers. But Christy, who worked part-time in public relations, took her case to the local media. After the New York Daily News ran an article and a photo spread on the garden, officials backed off. For a dollar a year, they leased the lot to Christy's group, which had dubbed itself the Green Guerillas. The Daily News story exploded like a virtual seed bomb, scattering Christy's ideas across the five boroughs. Soon, she was working full-time, consulting with other neighborhood groups. The feedback loops were whirring rapidly as wildcat gardens sprouted far beyond the Lower East Side. Even the city belatedly jumped on the bandwagon. Starting in 1978, a parks department program called Green Thumb offered plants, tools and horticultural expertise. It also offered dollar-a-year leases to community groups that wanted to cultivate vacant lots. The lease money often went uncollected. At the height of the movement, in the late 1980s, the city hosted more than 800 of the homegrown gardens. A survey by Green Thumb found the gardeners were growing over $1 million worth of produce each year. If their rows were laid end-to-end, they would stretch the length of a 67-mile round trip on the "A" Train. As the feedback loops got broader, they spread beyond the five boroughs. In 1976, a Brooklyn congressman persuaded the U.S. Department of Agriculture to support urban gardening with grants and technical assistance. The program eventually covered 22 other cities. New York gardeners joined those from smaller programs in other cities in 1979 to form the American Community Garden Association. The Big Apple was fertile soil for guerilla gardening. Some of the seeds had been planted years before. Both world wars and the Great Depression had inspired city government to sponsor "relief gardens" and "victory gardens" on unused land. Each time, they were abandoned once the crisis had passed. Like those earlier eras, the 1970s was a time of financial stress. New York City was flirting with bankruptcy and its services were in disarray. In poorer parts of town, whole blocks had gone vacant as landlord after landlord let their properties go. The city had repossessed thousands of lots and was closing police and fire stations, letting the houses crumble. "People were watching their neighborhoods decline, and it was killing to them," says Jane Weissman, director of Green Thumb from 1984 to 1998. "A house would come down. Maybe it was arson. Maybe it was abandoned. You would end up with land, end up with the city maintaining it, end up with garbage, rats, drug dealing and chop shops. People were devastated by what going on in their neighborhoods. There was a sense of, 'If we don't do it, it's not going to get done.'" What was novel about this generation of gardens was that they weren't planned by city hall. They were springing up, literally, from the streets. Desperate neighbors, fed up with waiting for the city's help, had launched their own urban back-to-the-land movement. "What we call the contemporary community garden movement really came out of the energy from the antiwar movement, the beginning of Earth Day," says Weissmann. "People were beginning to take control of own environment, especially as cities began going into fiscal crises and were not able to provide services to people." The gardens offered an array of services that city government was no longer providing. Like vines climbing a trellis, their environmental and social services were closely intertwined. A chronic environmental need, for most New Yorkers, was open space. As of 2002, the city had 4.5 acres of parkland per 1,000 residents, according to a survey by the Urban Land Institute. By comparison, Philadelphia had 7.1 acres and Boston boasted 9.3. The gardens made up a mere 200 acres, a small fraction of the Big Apple's 36,000 acres of parkland. But many were concentrated in areas underserved by city parks. Fifty were on the Lower East Side, where the ratio was only .6 acres of parkland per 1,000 residents. Much of the space was filled with greenery. Some called the gardens the "lungs of the city." The plants pumped oxygen into the exhaust-laden streets and provided islands of shade and cooling in the long, hot Manhattan summers. Recent behavioral science suggests that green space can aid mental as well as physical health. A 2001 study by New York State College of Human Ecology at Cornell researcher Nancy Wells found that children who moved to greener surroundings improved their attention spans. At Texas A&M, professor Roger Ulrich has found that "healing gardens" in hospitals can speed the recovery of patients, primarily by reducing measures of stress. In the New York gardens, much of the greenery was edible. Low-income residents could eat healthier diets in parts of town where fresh produce had previously been impossible to buy. Green Thumb found that 75 percent of the gardens also gave food away, to food banks and to hungry neighbors. In other cities, a survey by the Philadelphia Urban Gardening Project found that urban gardeners ate fresh produce from their gardens five months of the year. A Rutgers University study in Newark found the average community gardener invested $25 a year to harvest $504 worth of food. Immigrants to the Lower East Side (or, as they called it, Loisada) often sowed native crops from Jamaica and Puerto Rico. "Besides our beautiful flowers and vegetables there are many herb plants that we share with the neighborhood," wrote Harry Lebrun of the El Bohio Boricua garden in Brooklyn. "Many of us who come from Puerto Rico believe these herbs are medically useful for high blood pressure, heart disease, earache, back pains and ulcers. Sunflowers are especially good for ulcers and they bring good luck." Plants weren't all that flourished in the gardens. The diverse flora created habitats for a diverse array of birds, insects, reptiles, amphibians and small mammals, echoes of the Manhattan that Peter Stuyvesant had known. At Christy's original garden (renamed the Liz Christy Memorial Garden after she died from cancer and her ashes were spread on the garden), a manmade pond attracted frogs. It was further stocked with turtles, fish and snakes. Gardener John English, a beekeeper, introduced a beehive that still turns out 100 pounds of honey a year. Once a year, garden volunteers are invited to bring jars and stock up. In small ways, advocates say, the gardens performed several other environmental services. They reduced toxic wastes, though soil experts at some gardens still cautioned against eating vegetables like lettuce, which absorbed lead. Corn and tomatoes were safer. The gardens were recycling urban land, and most used recycled materials, from manure to scrap lumber - an economic necessity as well as an environmental one. Even many of the plants were recycled. Rockefeller Center donated plants, as it changed exhibits every month. By reducing the fruits and vegetables that had to be shipped into Manhattan, the gardeners saved gasoline and cut down air pollution. Nutritionist Joan Gussow calculates it takes 435 fossil fuel calories to fly a 5-calorie strawberry from California to New York. While gardeners created natural habitats, they were transforming social ones, as well. "We call them outdoor community centers," says Rebecca Ferguson, associate director of the Green Guerillas, "places where neighbors know each other, where maybe there are no other opportunities for neighbors to walk out the front door and socialize. I also think they increase a level of safety and accountability." Several studies nationwide suggest that gardens and green space might help to lower crime rates. In San Francisco's Mission District, the Trust for Public Land reported a 28 percent drop after a garden led to the formation of a neighborhood watch group. In Chicago, professors Frances Kuo and William Sullivan compared crime rates among 98 apartment buildings in a public housing project. They found buildings with high levels of vegetation had 52 percent fewer crimes than buildings with low levels. The story of the Little Puerto Rico garden, at 10th St. and Avenue B, paints a vivid picture of how a garden can tip a neighborhood away from crime and other social ills. After five corner tenements were knocked down in 1977, their lots became home to a junk dealer who stripped empty buildings. They also became a shooting gallery for junkies and crack addicts. A decade later, neighbors cleared the site of abandoned cars and twelve dumpsters of garbage. After some fights with hoes and baseball bats, they accomplished what city police had not: They cleared the corner of drugs. In its place they put in vegetable plots, a brick patio and two Puerto Rican-style casitas or small houses, complete with a propane-fired stove and flush toilet. Among the garden rows, and the clucks and snuffles of chickens and rabbits, they recreated a bit of their faraway homes in the big city. "It was a place for all people on our block to go and bond together," recalls Sara Ferguson, a journalist who moved next door to the garden in 1994. "People had weddings there and birthdays there. People came and cooked meals there. On Friday and Saturday nights, people would all be out there eating together and playing drums. There was a huge Halloween party, when the casitas would become haunted houses." She got to know her neighbors as she dug the soil alongside them. The elderly Don Garcia taught her how to mound a tomato plant, and which weeds were worth keeping for medicinal purposes. Lydia Cortes, a mother of five, oversaw the garden while her husband, Isais, fixed cars in the back. Other gardens hosted more formal activities, from plays and dance to yoga and poetry readings. Artists in the Gardens planted paintings and sculptures on walls and pathways, while the Youth Murals Project gave more than 2,000 teens an alternative to grafitti. Each space had its own character and a unique set of services. The Garden of Eden on Eldridge St. was featured in National Geographic. It was a painting in plantings, with meticulous floral displays and 45 fruit and nut trees, surrounding a central yin-yang symbol. On E. Ninth St., La Plaza Cultural featured an ampitheatre and a geodesic dome built by R. Buckminster Fuller. El Rincon, in the Bronx, sat next to a methadone center. Recovering addicts came over to pick apples. "You would have to pay somebody grant money, city money, to do this stuff," says Ferguson. "To provide community space for programs, to reintegrate drug dealers. You're always trying to find money for parks funding, and people are already doing this on a volunteer, ad hoc basis." As a social and ecological welfare program, New York's gardens were a stunning success. But their very success became a threat to their existence. As they tipped their neighborhoods into more desirable stability domains, they spun off a new feedback loop: rising property values. As the city recovered from its slump of the 1970s, officials began to eye the garden lots for uses other than flowerbeds. In a 2002 memo, city council staffers wrote, "The communities in which they are located have, in many cases, seen a dramatic resurgence, causing many of these abandoned lots to now have value as sites for development, such as affordable housing, or as locations to be auctioned for private development, at which point they would return to the tax rolls." The Green Thumb gardeners had always had a sword dangling over their heads. The city viewed them as temporary and reserved the right to sell most of the lots at its whim. In the late 1980s, the sword began to fall. At first, only a handful of gardens went on the chopping block, making way for low-income housing and drug rehabilitation centers. The Garden of Eden fell in 1986 to make way for a HUD project. A full-scale plague of bulldozers descended after 1994, when Rudolph Giulani became mayor. As U.S. Attorney, Giulani had helped plow under the Garden of Eden. As mayor, he wanted to auction off vacant properties to help the city pay its bills. This time, the buyers were not Section 8 builders but conventional real estate developers. With little warning and no legal rights, gardeners found city council selling their ground from under them, often on the basis of staff reports that portrayed their urban oases as blighted wastelands. Little Puerto Rico was flattened the day before New Year's Eve, 1997. The city had denied it a Green Thumb lease, citing imminent plans for development. Residents celebrated a pyrrhic victory when the first bulldozer sank headfirst into a sewage trench. Within a year, however, four-story townhouses were rising from the rubble. But city officials had not reckoned on the deep roots the gardens had put down among New Yorkers. By threatening all of them at once, the administration galvanized gardeners from potting soil into politics. They formed the New York Garden Preservation Coalition, and another new feedback loop began turning. "It was the first time in community garden history when gardeners were working together to that degree," says Rebecca Ferguson. "Before that, they worked in their own lots and did their own thing." Some groups went to court, while others returned to the locales where the gardens had first bloomed: the streets. At Giulani's second inauguration, on New Year's Day 1998, a group of gardeners unfurled a protest banner. In July, protesters released thousands of crickets into an auction hall. At the leveling of El Jardin de la Esperanza, 31 were arrested while sitting-in at a shelter shaped like a coqui, a Puerto Rican tree frog. The administration responded by raising the stakes. In April 1998, it moved all 741 Green Thumb gardens from the parks department to the department of Housing, Preservation and Development, with orders to liquidate the property. Soon a block of 114 gardens were put up for auction. As the feedback intensified, larger players came to the gardeners' aid. The largest was state Attorney General Eliot Spitzer. The day after El Jardin de la Esperanza was destroyed, he won a temporary restraining order from an angry judge, putting most sales on hold. Just as a variety of species strengthens an ecosystem, a variety of tactics was putting the brakes on the bulldozers. "All our organizing and the media coverage we received for our events, rallies, letter writing, and lawsuits, finally shifted the thinking from, 'The gardens are temporary,' to, 'The gardens are permanent - and should be preserved forever,'" says organizer Felicia Young of Earth Celebrations. In May 1999, the 114 gardens were rescued, hours before the auction, when two nonprofits bought them for $4.2 million. The money included a high-profile, $250,000 contribution from New Yorker Bette Midler. Three years later, Giulani's successor, Michael Bloomberg, was ready to settle Spitzer's lawsuit. The city agreed to offer 198 gardens back to the parks department or nonprofits. Another 114 sites could still be sold, but only after a "garden review process" in which the city had to offer the gardeners a substitute piece of ground. With that settlement, the gardens and the city had settled into a deeper stability domain. No new gardens were springing up, while the movement turned its attention to developing the 600 it had fought so hard to preserve. But the momentum from Liz Christy's first, defiant enviromental tip goes right on spreading, in unexpected directions. One spinoff is the Rites of Spring, a day-long parade, puppet and costume pageant that stops at 40 Lower East Side gardens every May. The garden saga is re-enacted in a character named Gaia, who is first kidnapped, then rescued. Her salvation is marked by the release of 50 butterflies. More practically, movement veterans are sprinkled throughout city agencies and nonprofit groups. They putting their experience to work to turn the Big Apple into the Green Apple. "We sort of infiltrated most places," says Tessa Huxley. Director of the Green Guerillas from 1981 to 1985, she still remembers the time she was planting a dawn redwood in the Liz Christy garden. Her pickaxe broke through the roof of a subway tunnel that rumbled just beneath the soil. Today, that redwood is 65 feet tall, and she's executive director of the Battery Park City Parks Conservancy. She manages the parks in Battery Park City, a city-within-a-city that's home to 25,000 people. "The parks are completely toxic-free," says Huxley. "We don't use any herbicides, pesticides or fungicides. We do enormous amount of composting. We take vegetable waste from local groceries and Starbucks coffee grounds. We look at our soils as what's gonna make plants healthy. We look at the chemical and biological components, and we develop the compost accordingly." Her example helped inspire the Battery Park City Authority to set "green" standards for all new buildings. Its first "green" residential highrise opened in 2003, with features like solar panels, recycled building materials, rainwater storage and vaporless paints. The first building leased out in six months, despite rents that started at $2,300. Looking back, says Weissman, "The gardens were tipping points, tremendous trifles. People were always coming into your neighborhood, saying, "Could you come into our block and show us how to do this. Our gardens inspired other gardens. There was a tremendous ripple effect of other gardens happening." Those ripples are still fanning out, far past the Hudson, says Loggins. "Two years ago, people from France were coming in. They wanted to start community gardens there. People from China were coming in, trying to learn how to start community gardens in China. People in Sweden also. So, apparently, it's still spreading."